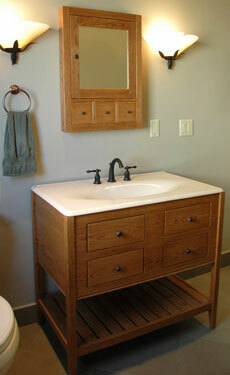 Solid wood furniture and accessories handcrafted and made to order for the price of manufactured. Our bathroom pieces are all made to order and are handcrafted from solid American hardwood; no plywood, no MDF, no particle board, and no veneers. Our pieces grace homes across Canada and in every state in the U.S. including Alaska and Hawaii. This web site comes to you from Meadowbrook Creations' Pro Furniture Builders organization; a network of more than 35 professional craftsmen and companies in the U.S. and Canada specializing in Shaker styled furniture and accessories. If you wish, you can read more About Us and how we got started. As part of a larger network our Pro Furniture Builders associates are able to achieve consistent quality in our products while at the same time providing a high level of local personal service. The closer proximity of our associates to you allows shipping and delivery costs to be minimized. Often times there is a Pro Furniture Builders associate close enough that you can easily pick up your order and totally avoid shipping charges! Please take a look around at what we have to offer and if you have a question about one of our products or don't see a particular style or configuration just call us at 603-860-9377 or email us. We are always happy to answer your questions. If you have any questions about our Pro Furniture Builders organization like "Is there one near me?" or even "How do I join?" please don't hesitate to call us at Meadowbrook Creations, 603-860-9377. See our Blog for the latest news and new product announcements. While you're there sign up to our email subscription. That way when we post new product announcements, specials, and news items you will automatically receive them in your email.